We know you love crystals as much as we do! 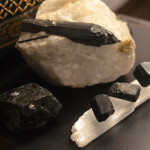 We now offer a Triple Play of three amazing Crystal Courses that will give you great information whether you are using them for yourself, or are a Lightworker wanting to incorporate Crystals into your other Healing Modalities! Find out what Crystals work for specific emotional, physical, mental and spiritual concerns. Enjoy examples of various crystals, learn about the Science behind why they work. 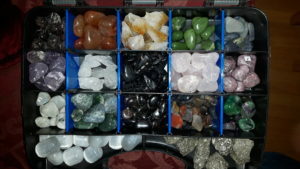 And learn how to use your INTUITION to properly choose crystals for yourself or others! 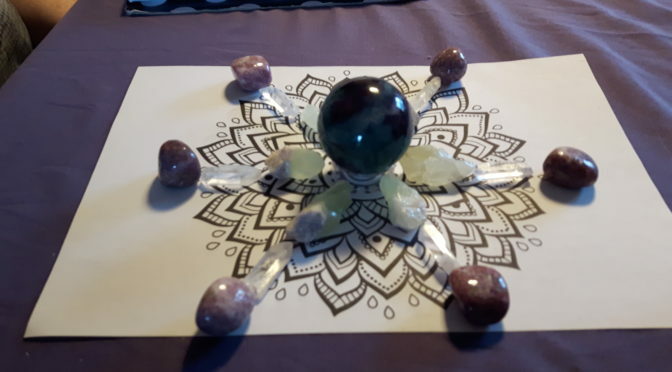 In this course we’ll learn the proper technique for setting up and activating Crystal Grids. We can work with these three main areas, but suggestions will be offered for other types of Grids. Learn how to grid a room/house, or to create a grid that looks beautiful and is very powerful, with a purpose. This very successful course has been offered by MoonLightWorkers for 4 years now, and many students and clients have found it to be a very helpful modality. Learn about the 7 Chakras and how to use Crystals to clear blocks and bring in healing, using a pendulum and carefully chosen Chakra Stones. Pendulums available for purchase, or bring your own! Hurry don’t miss out Please Email with questions to moonlightworkers@gmail.com or reply to this email. Offer is time limited. Prepayment must be received before first class. Payment plans are available. Classes must be taken within one calendar year of sign up. One to one classes are also an option. 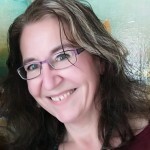 Understanding the link between you and your Angel and Spirit Guide team, connecting with your intuitive gifts, and gaining greater understanding of how to know which gifts are most prominent in you. We’ll unwrap the way you perceive the world on an Intuitive Level, focusing on how the gifts present themselves in you, show you the other gifts you have but didn’t realize were part of your four Clair Senses. Once you are aware of how your gifts work, we’ll use a basic tool to help you practice using them. Oracle cards have been a key tool to aiding people to gain insight into their own lives and assist others in their journey. 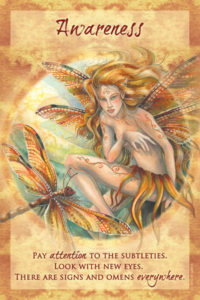 Join us for this delightful introduction in reading your own Angel Cards. Learn about identifying your gifts, understanding how you receive your messages from your Angels and Spirit Guides, enjoy learning some breathing techniques to help you to connect with your higher energy. We cover information from my e-book “10 Steps to Knowing Your Intuitive Self”. No experience is necessary. Main focus of this workshop is to help you learn how to trust your guidance. Please reserve your spot as soon as possible via email to moonlightworkers@gmail.com. Prepayment is required to hold your spot. 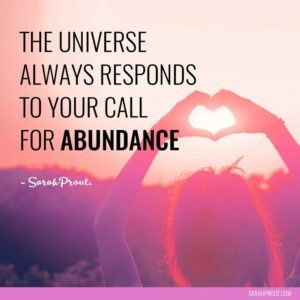 The second opportunity to work with your Intuitive Gifts! In this course, we will take time to review any experiences or questions you have around doing readings for yourself and others. 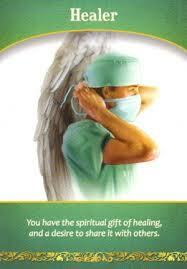 We will also explore more ways to have the Angels assist in healing yourself and other people, doing Angel Energy Work. Understand how to be of service while following your Life’s Path, and protecting your own energy. 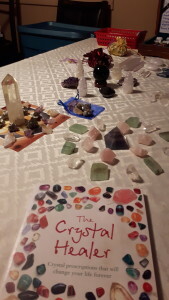 In addition, we will be working with Crystals to clear your Aura and how to effectively practice Etheric (Energy) Cord Cutting, for yourself and your clients. 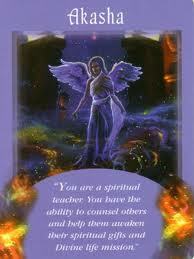 We will also review using pendulums as well as Angel Cards to assist in your readings. Review of moving to a 30 minute reading using multiple decks. Grow and expand what you have learnt in Levels 1 and 2, using your Intuitive Gifts, and You’re your ability to assist yourself, and others on your Spiritual Journey. In this workshop, we will learn how to call in your Angels and Archangels to assist in releasing that which no longer serves you and helps you on your healing journey. Using Techniques developed by Doreen Virtue and Cindy Smith, AAEP, we will show you 2 amazing techniques to release yourself from emotional pain, fears, and negative energy. In this course, we will cover Energy Ball Release and Past Life Healing. 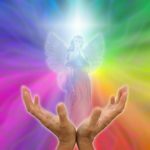 Each technique is connected to specific ArchAngel Energy, and we will cover who helps, and how they help you. What do you need to improve things in your life? Join me while we explore how to start to shift your self and your life to bring in what you desire. Only MAX 8 spots available for this new, exciting course! Most people are sensitive to other people’s energy. Do you ever notice how you can walk into a room and feel that there was an argument prior to your arrival? Can you notice the difference when you walk into a room where there is a celebration in progress? What does this mean? An Empathetic person can feel other peoples’ energy. You may find yourself drained after a day at work, and realize that you feel so much better when you get home, into your own space. This is because you are carrying energy that does not belong to you! In this course, we will explore the various methods of shielding yourself from other people’s energy. In addition, we will speak to protecting your space at home or at work from negative energy. Explore the tools, and the methods of making yourself more resilient and retaining your own personal energy. When: To be advised, private one to one available, message me! Crystal and Smudge tools will be available for purchase. Balancing your current work and your new Healing Business can be a real challenge! I’d love to share with you how to build your plan of action, steps to take and ways to increase your Business doing what you love! Understand the energy behind giving and receiving, the energy of money, and how to manage growth in your business. No matter the modality you choose, you will learn how to find and book opportunities, how to increase your reach using Social Media, and how to choose the best opportunities to suit your current business size and budget. With over 9 years’ experience with a Lightworking Business and 16 with my own home based business, I have passion and the knowledge to share with you! Please join me to learn great tips and techniques to help you live and work your life’s purpose!! A two day course (4 hours a day) introducing the basic Reiki practices and methodology, beginning symbols and some meditations to gather focus. Two day commitment one evening, next morning. The lineage you are entering comes directly from Dr Usui, Dr Hayashi, Takata-Sensei, Wanja Twan and Rebecca Hay. It is my humble honour to practice this same lineage for the past 5 years as a Reiki Master. I was taught from my teacher Rebecca Hay, coming from her master Wanja Twan, that during a Reiki class the teacher is like one candle lighting another (the reiki student). Reiki is powerful hands on (or off if asked) energy work to balance and heal the body. Please contact me if you have questions. This is covered over two evenings. 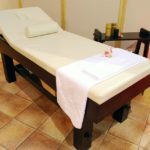 Two day course that introduces those attuned to their 1st level, to the more advanced symbols of Reiki, allowing healing to happen at a distance, also clearing and sanctifying techniques for the patient and area. Usually held after Level 1, same morning in conjunction with that class. Our monthly gathering of students who have taken Beginner Angel Card Course to practice reading with each other. Intermediate Students can also practice crystal / angel healing techniques. Room for 10 participants maximum. Supporting you in your growth is very important to us, and we’d love to invite you to come and flex your intuitive muscles for 4 hours in a loving and supportive learning environment. Cost includes personal one to one coaching as required, basic questions around business development can also be answered. Please reserve your spot as soon as possible via email to moonlightworkers@gmail.com. Prepayment is required to hold your spot. 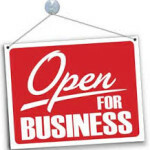 One to One Coaching – $50-120 per hour depending on subject, contact me for more info. All Classes can be one to one, ask if one of these dates don’t meet your needs! 4 Hour workshop for you and your child(ren) to learn how to understand what they see, feel and hear. Children are very open to healing, growing and discussing their perspective on spiritual matters, their dreams, and their Imaginary friends. Spirit Guides and Angels spend a lot of time with your children, and it is important, as a loving parent, to provide them with guidance and support. Includes talking to spirit guides, guardian angels and learning basic meditation. 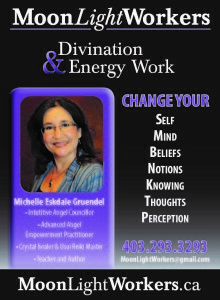 Michelle Eskdale Gruendel, is a certified Advanced Angel Empowerment Practitioner AAEP™, Usui Reiki Master and Certified Crystal Healer CCH™ who works with the Angelic Realm and the Crystal Realm to support your growth and healing. And Sole founder and practitioner at MoonLightWorkers. Connect with your Angels and Spirit Guides, and find out what you need to know right now. We can now offer payment options of cash, email transfer and MasterCard, Visa and American Express, or Paypal, just let me know!